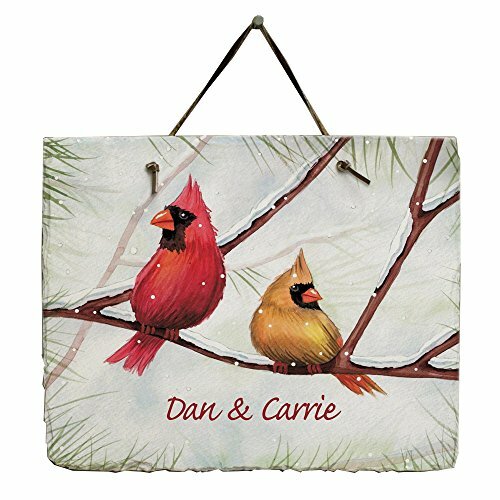 Our custom winter scene wall plaque will have this friendly pair of cardinals welcoming guests throughout the holiday season. 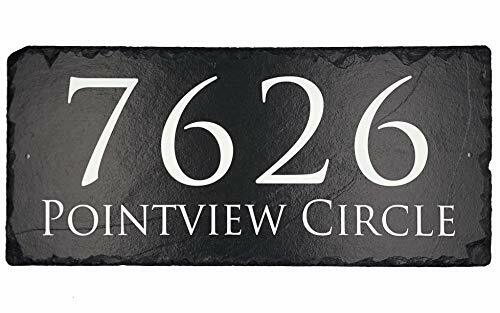 Our Personalized Christmas Signs are natural slate plaques that will be beautifully customized with any personal message up to 40 characters! Our winter birds sign with custom message measures 11.5" W x 9" H and comes with a leather strap for easy hanging. Display your family initial, address, and established date with this beautiful name plaque! 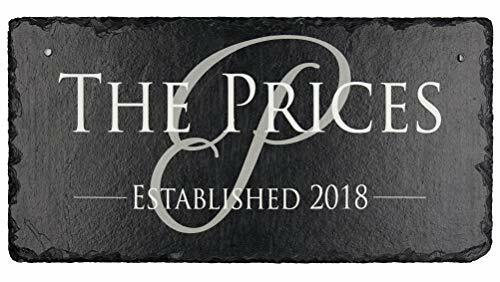 Using a hand-cut, fine-grained slate, this sign is perfect for placing on your porch, at the bottom of the driveway, or hanging from your house or garage. This weather resistant slate is approximately 12" x 6". As this is a hand-crafted item, the dimensions may vary slightly. We use a process called UV printing which results in an incredibly high definition and weather resistant finish. 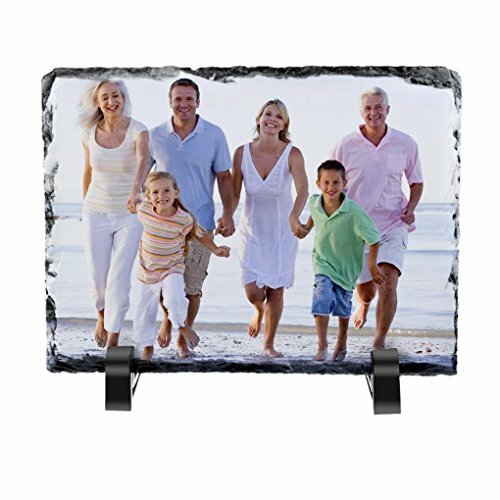 Ideal to display images of family vacations, pets, weddings, special events, professional or hobby photo shoots. How to customize products? Switch/choose color/shape from the above buttons. Customize your photo by clicking on "Customize Now" at the top right. Add to cart after you have completed with your information. (Or after you place your order, use the contact seller option on "Your Orders" page to send us your custom content) Note: Please check your customized information carefully. Unless there is a quality problem, otherwise, any kind of cancel and return will not be acceptable, once the product has been completed. 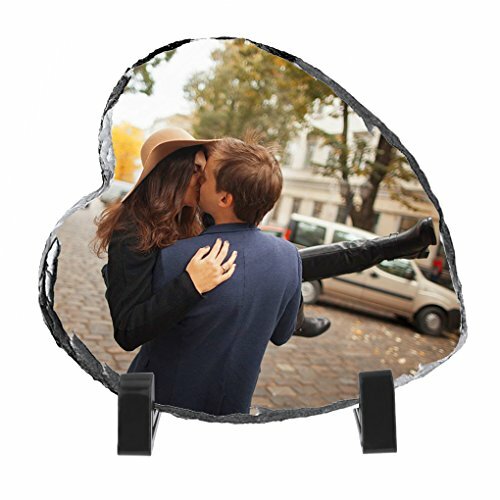 Personalized Photo Frames Heart Shape Rock Slate Picture Plaque Frames with Holder Customized Birthday/Baby Birth/Valentine's Day/Christmas Gift,Home Office Desktop Decor,7.1"x7.9"x0.4"
GiftsForYouNow Failte Personalized Irish Slate Plaque Sign, 11.5" x 9"
Failte means Welcome. 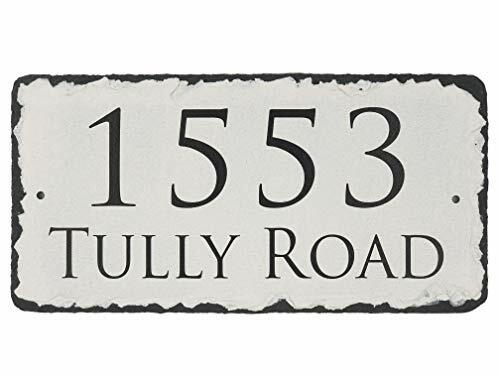 Give a warm Irish welcome to all of your friends and relatives with this great personalized Failte slate plaque. 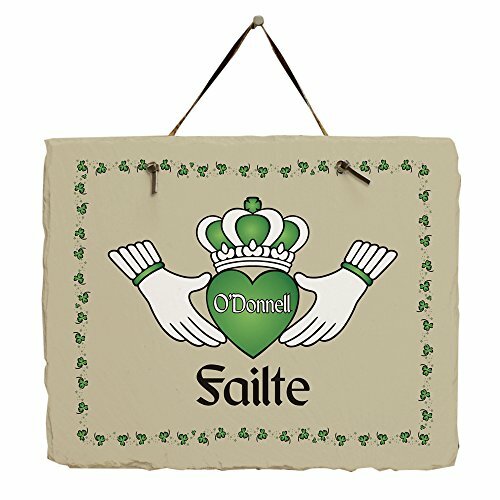 Irish welcome plaques are great to display all year long or for St. Patrick's Day. This personalized Irish natural slate plaque features a wonderful Claddagh design & measures 11.5" W x 9" H. Each natural slate plaque arrives with a leather strap for wall hanging. 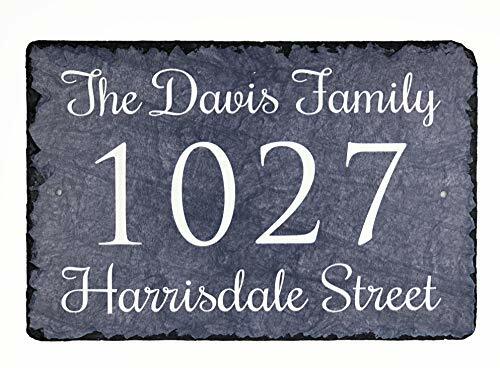 Personalize your slate plaque with any family name (ex. O'Donnell) at no additional cost. *Slate plaques have a rough, natural slate look. Each plaque has its own natural variations in texture and edge. Greet guests (and family members) with this sweet, loving blessing. The very merry plaque will light up the room with Christmas spirit! Elegantly fashioned from slate, this memorial plaque features heartfelt words to comfort grieving hearts. 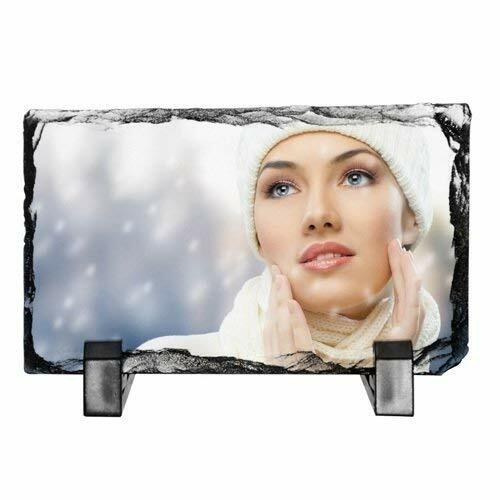 Share the feeling of love with a personalized Sandra Magsamen rectangle plaque. Rectangle plague features the message: i love you to the moon and back. Personalized with any name, up to 16 characters. Resin plaque with beaded handle/hanger measures approximately 7 inches long by 3 inches high and overall with handle 7 inches by 4-3/4 inches. Our wall slate takes you back to a time when a beautiful Christmas decoration like this was handmade by a skilled craftsmen. Share the feeling of love friendship with a personalized Sandra Magsamen rectangle plaque. Rectangle plague features the message: good friends are like stars, you don't have to see them to know they are always there. Personalized with any message, up to 20 characters. Resin plaque with beaded handle/hanger measures approximately 7 inches long by 3 inches high and overall with handle 7 inches by 4-3/4 inches. Wrap up the holiday decorating in retro-cool style with the ornament-filled wall slate. The exclusive design features the phrase of "Country Kitchen" and "Friends Welcome". They complete the look by adding any single initial inside the rooster.